Sydney, 15 January 2014- 2014 will be the turnaround for the Australian economy and commercial property markets according to a new ViewPoint from CBRE. The report states that despite the current sub-trend economic growth, 2014 will see consumer and housing sectors show significant growth, which will help offset the drag of mining investment. Economic growth was below trend for 2013, with growth of close to 2%, compared with a long term average of 3.25%. However, Stephen McNabb, CBRE’s Head of Research for Australia said that while the early part of 2014 is expected to also feel a little flat, the prospects for growth in the second half are looking more favourable. “Retail sales, approvals for new houses, asset prices and confidence have all approved in the last 3-6 months, most likely a delayed response to the interest rates cuts. We expect 2014 and 2015 to see a recovery in consumer spending which will be more supportive of a broader recovery, together with a stronger boost from net exports,” said Mr McNabb. “We expect to see the economy growing at a rate around 2.75% by the end of 2014 and 3.5% in 2015. The two states with the highest improvement prospects and NSW and QLD,” he added. The report states that the housing market will provide the biggest boost to the economy, particularly in NSW. Dwelling approvals were up almost 20% year on year nationally in the third quarter of 2013. Victoria has been overtaken by NSW in terms of activity, with QLD also faring well. WA will see slowing levels of activity as economic and population growth eases post the mining investment boom. The office rent cycle is expected to remain under pressure for an extended period, with vacancy rates continuing to climb throughout 2014, peaking in 2015/16. This will keep a lid on rent growth across all markets as supply exceeds demand. The outlook for the retail sector is expected to improve as spending levels rise in response to lower interest rates and improved economic growth. While a boom is not expected, modest increases in credit appetite from households supports the sector moving forward. 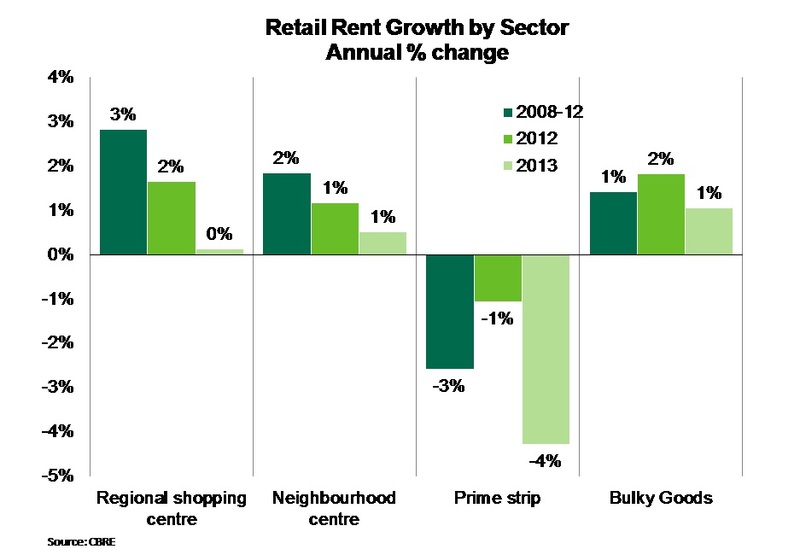 Industrial rent growth softened to a flat overall performance in 2013, but the report states that rents are expected to stabilise through 2014 and to recover in 2015. This will support a broader yield reduction in 2015 as the rent growth recovery becomes a little more entrenched. While the demise of local car manufacturing has grabbed the headlines (following the closure of Mitsubishi in 2008, Holden and Ford’s decision to close domestic manufacturing from 2016-2017), the positive kick to the broader manufacturing sector from a lower AUD, an emerging recovery in the housing sector and consumer led growth is expected to provide some offset. Indeed, the motor vehicle and parts manufacturing sector produces $20b worth of output per annum, marginally smaller than a decade ago ($21b), while the services to transport and storage sector grew from $28b to $54b in the same period; the latter being a bigger driver of industrial property performance. The key point for prime property yields in 2013 was an improvement in risk premiums with borrowing costs stable, having fallen significantly in 2012. Lower risk premiums coincided with a reallocation from cash into property and equities by domestic fund managers. International demand for Australian assets was also strong. The annual foreign acquisition total of $4.8 billion eclipsed the previous 2011 peak of $3.4 billion and the expansion of this sector continues at a fast rate, increasing by over $15 billion since 2007. In 2014 the outlook remains positive. While Mr McNabb expects to see a gradual decrease in the amount of foreign investment as the rest of the world economy begins to improve (particularly the U.S.) and the high relative interest rate wanes, he doesn’t believe this will signal an unwind of Australia’s existing position.